Things have been quiet on the Chris Sharma front of late, but the season is apparently on in Spain as Sharma did the FA of Power Inverter at Oliana over the weekend. According to this update on girlfriend Daila Ojeda’s blog he is proposing a grade of 5.15a for this new line. Who cares? Well, you clicked… and then you commented. I’d say you might care. I hear ya. I’ve always wanted Sharma to get his Trad on and see what he could do. Kauk’s Magic Line still needs a 2nd Ascent. Can’t believe NO ONE has even tried. you are uninformed. It has been tried by quite a few. I’m beginning to lose track, so I made a small list from memory and google. Did I miss something? That is a totally unimpressive ticklist. Daniel, I can’t believe you would even have the sack to post it here. Clearly, you must be a homosexual. Now, if Sharma were to use his superhuman powers to climb something I only wish I could climb–that would be noteworthy. Until then, please don’t post anything on a climbing website that I don’t approve of; it’s really hard to maintain the illusion that my opinions are the center of the universe, as I’ve always believed. Thank you. You know times have changed when 5.15 does not impress the folks. I just can’t wait to see what this new group of crushers are going to do on a rope. 5.16 was such an impossible idea years ago, but now it seems only a matter of time. Good for him for getting a project, but that are so many people out there crushing that the number 5.15 will soon be climber by more and more people. Kids are coming out of the wood works and flashing v 12’s. People have now become desensitized to super human displays because the internet has shown us that there are a bunch of mutants out there. I’m not jaded with 5.15. I have absolutely NO relation to what that means. It’s so far and above most climbers abilities that unless you actually SEE the climb, you really don’t have a CLUE what 5.15 means. Things like the TC and KJ project have at least SOME meaning to people because they place gear and are probably familiar with the Captain. Still way out there but there are some tangibles. Any updates on Sharma still working FRFM. I hope he gets the FA on this route with all his dedication and hard work put into it. FRFM is probably one of if not the most incredible rock climbs I have ever seen. 99.9% of whom will never rope up or see climbing as anything other than instant gratification (bouldering). Enough with the talking down on bouldering . . . try a boulder problem that takes you years of work to send, then tell me that it’s all about instant gratification. 5.16 is coming, I’m sure. Maybe not next year but in 5-10 years. Dave Graham once stated that climbing two 9as in a row would probably already equal 9b+ or 9c. So, how long will it take for someone like Ondra to climb two 9as in a row, or a 9a and a 9a+ or two 9a+s? You have to consider that he hasn’t really tried so far. 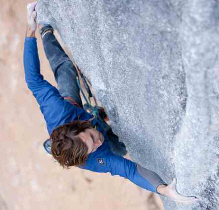 The hardest thing he has done to date (Golpe de Estado) took him something like 30 tries, and only because conditions were bad..
@Chris: According to BigUp Blog, Chris Sharma is working on FRFM again, with a new solution for the crux. I clicked to post “LAME” but everyone already beat me to it. Numbers are dead, trad LIVES!